Then choose a distance, gas price, and select the MPG levels you want to compare. The calculator will tell you how much gas you will consume over that distance of driving for each MPG level. 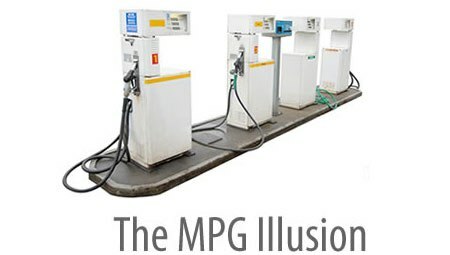 The difference in gas consumption between the MPG levels is a direct indicator of CO2 savings. Saving 1 gallon of gas saves 20 pounds of CO2 emissions. Saving 100 gallons of gas saves 1 ton of CO2 emissions. The table shows the gas savings of turning in a low MPG car (18 and below) for a higher MPG car. The gas savings are over 10,000 miles of driving. Saving 100 gallons of gas saves 1 ton of CO2 emissions.